The Interior Design program at Al Ghurair University offers in the first year foundation courses combined with essential software courses, which triggers the students capabilities to plan and design indoor environments. Starting from the second year the program progresses into various studio classes, from residential, retail, business and hospitality, which provide them the ability to determine the appropriate design solutions based on function and habitat requirements considering the occupants wellbeing and safety. The studios are coupled with group of specialized courses, where students learn sustainable solutions, healthy interior environment design, and light & acoustical design. Students will also learn to execute design by producing construction and design documents, as well as materialization of the same. 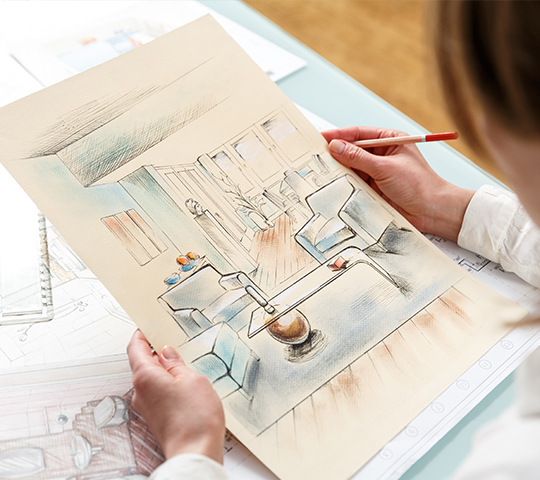 Graduates are prepared for a career in interior design and its related disciplines. Fresh graduates tend to begin their career working with senior professionals at multi-disciplinary firms in industries such as architecture, interior design and engineering. Some graduates may choose to work for manufacturers or in furniture showrooms. Graduates can also set up their own interior design business or become a partner in a consultancy firm. Interior Design graduates are educated to identify and solve problems related to humans and their use of interior space. Projects may take place in a wide range of settings including: Office spaces and industrial premises; Retail locations, e.g. shops, cafes, restaurants; Hospitality and Leisure spaces, e.g. Hotels, Cinema Foyers, Holiday Complexes; Residential developments; Domestic properties; Ships and aircraft; Public buildings, eg. Government, Museums, Education and Civic buildings. Public buildings, eg. governmental buildings, museums, educational institutions and civic buildings. © 2018 Al Ghurair University.